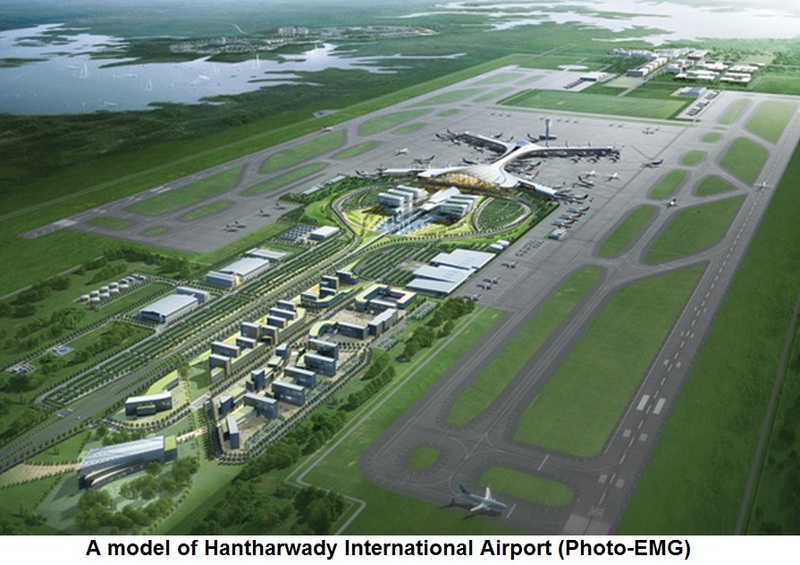 Construction work for a new Hantharwady International Airport will be start in early 2014, as Myanmar gears up to receive growing numbers of visitors. Yangon International Airport, currently the country’s main entry point, handles 20 million passengers a year and will be upgraded to receive another 6 million. Major extensions, however, are restricted due to a surrounding military airbase and residential areas. “The Yangon Airport is located too close to residential wards. Also the designated area of the airport is 1,000 acres but there are restricted lands like the military airbase so we estimate that the airport can only be expanded to handle 6 million passengers. We have hired Japanese experts to do the estimation,” said Tin Naing Tun, director-general of the Department of Civil Aviation (DCA). Yangon Airport currently relies on one runway which it shares with the Mingaladon Air Force base. The airport was temporarily closed on September 30 this year after the parachute of a military fighter jet failed to open on the runway. International investors are vying for construction contracts on major infrastructure projects as Myanmar races to upgrade the country’s hotels and tourist sites to accommodate growing numbers of visitors. Korean’s Incheon Airport Consortium has been awarded the tender to build the Hantharwady International Airport and are currently discussing the details of the contract with the DCA. “We have discussed the contract for the second time. The meeting will be held for three times and in early November, the contract will be signed by that time. The construction work will be start in early 2014,” said Tin Naing Tun. However, the DCA insists that it will not accept the tender if there are discrepancies with what the company promised during the tender selection process, according to the director general. As Myanmar braces for record numbers of visitors for the upcoming the Southeast Asian Games in December and the tourist season, Yangon Airport will remain the first port of call. The airport received over 450,000 visitors between January and September this year.